​Ideas are fast and furious, there never seems enough time in a day. Pieces are worked on several at a time following a variety of themes. Mystical creatures, magical birds set against traditional and not so familiar landscapes. I take inspiration from regular research visits to galleries, and museums in London, Bristol and Gloucestershire. Several works resulted from a visit to Kelmscott Manor and the British Museum. Equally, I am fascinated by medieval textiles, carvings and manuscripts. This contrasts with abstract expressionist painters such as John Hoyland, Bert Irvin and Gillian Ayres. Drawing is fundamental to my design process. It solves many issues of scale, colour, pattern, shape and line in a relatively short period of time. All my work is stitched either by hand or machine and sometimes both. The direction of the stitches creates surface texture and patterns relatable to mark making in drawing. Vintage hand stitched tray cloths are often used as a base fabric and the motifs hidden, revealed and reworked. Some pieces hint at humour, the manner in which one bird is looking at another. 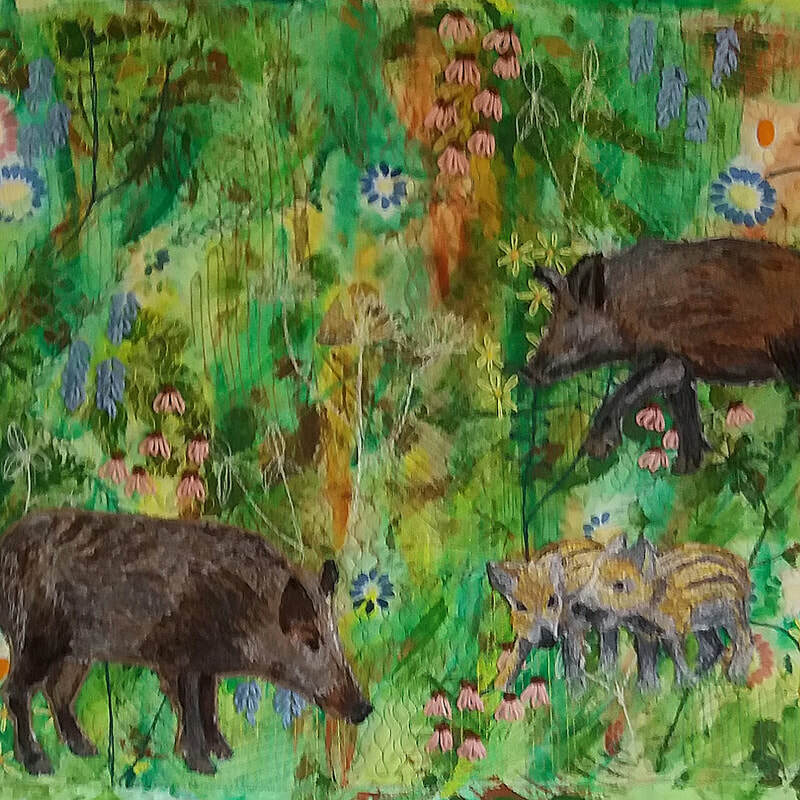 Other themes aim to address an issue such as the damage to many of the green spaces in the Forest of Dean by the wild boar. These are ‘early days’ and I am still exploring, questioning and extending myself.